Beate's Inspiration Challenge #27 is to use the colors or pattern from this beautiful scarf. My eye was first drawn to the rich colors of burgundy and dark grey and made me think of winter and snow. I sat down to create this card yesterday and couldn't come up with a thing, except to choose some patterned paper that I thought would work well. Today I had my inspiration come back to me for a bit and created this Joy card. I pulled out my silver embossing powder and heat gun for the snowflake (which is also used to represent the "o" in joy). The card itself is pretty simple, but I've decided that sometimes simple is OK. Thanks for the fun challenge, Beate! Cardstock, Patterned Paper, Stamps: CTMH; Nestabilities; Other: shimmery ribbon (reasonableribbon.com); silver metallic gel pen, platinum Bella dots. Beautiful Christmas card! Love it! 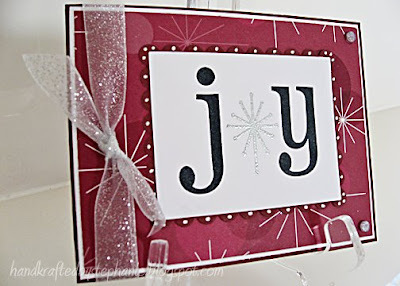 I love that you used the snowflake for the O in Joy! I also like the scallops you created around the sentiment! So cute!